A short biography of Bulgarian anarchist Alexander Metodiev Nakov, including a police file with information about him. The document printed below was lifted from the records of the Prefecture of Police (MVR) in Pernik, Bulgaria and it concerns an anarchist militant by the name of Alexander Metodiev Nakov. It was passed to us by the Bulgarian Libertarian Union (ULB) in exile whose accompanying note stresses that "this anarchist's dossier is a splendid biography supplied by the police themselves" and adds: "For this testimonial, Nakov is indebted and we are all grateful to the DS and its agents, the informants whose names are given inside inverted commas. It is more than just a simple biography of an anarchist fighting for freedom and justice: it amounts to a multi-biography of an entire people in its unflinching struggle." We have decided to retain the essential style and pattern of the text, contenting ourselves with eliminating the biographical details of A. M. Nakov's two brothers and two sisters. Alexander Metodiev Nakov was born on 1 August 1919 in the village of Kosatcha, Pernik department, a Bulgarian, resident in the town of Pernik at No 86, Machala Teva, in the Petko Napetov district. Works in the Republic mine as a locomotive fitter. Educated to 7th grade. Descended from a poor family. Married: two children. 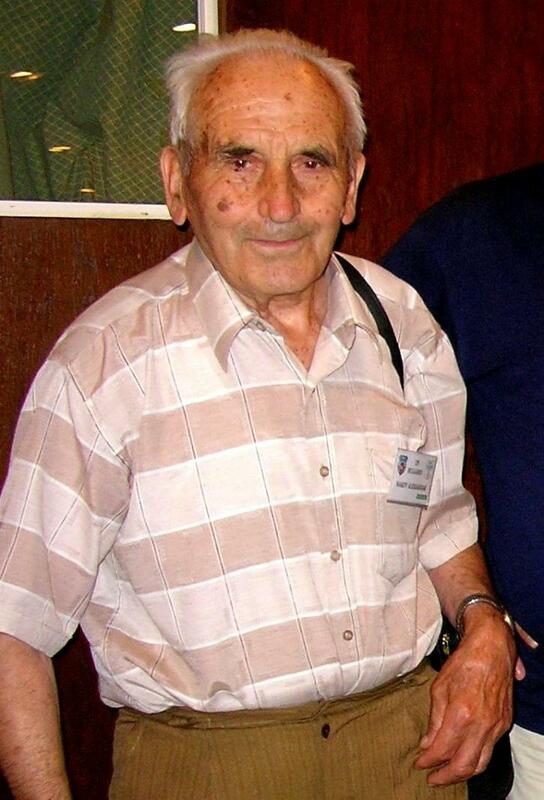 His wife, Kirilka Alexeyeva Metodieva, born 28 September 1922, in the village of Viskar, Pernik department, lives at No 86, Machala Teva and works at the Machinostroitel plant in Pernik as a factory hand. As in the past, she is today non-party (apolitical): under her husband's influence, her position towards the popular authorities is unfriendly. Alexander Metodiev Nakov, following his primary schooling, worked for a time as a farmhand: after arriving in Pernik, he started work in the mines in Pernik. At present he works as a filler in the Republic mine. As a worker and producer, he is very good and carries out his production tasks conscientiously. As early as 1937, he entered the ranks of the anarchist movement and embarked upon militant activity: he helped launch an anarchist group among the workers of the erstwhile machine department of what is now the Machinostroitel plant. In 1941, the subject and five other anarchists were arrested by the police and sentenced to 6-8 years in close custody. He served 3 years in prison. After release from prison, he stayed in his native village, carrying on with his anarchist activity along with the subjects Miltcho Slavov, Asparoukh Grouzhov, Jordan Borisov, and Gueorgui Kirilov, all of them from Kosatcha village. At the end of 1944, he came to Pernik to work: and took up with Dimitri Vassiliev, Bojan Alexev, Laserman Asenov Minev, Maria Duganova, Kotze Zacharinov and others. They set up an Elisee Reclus anarchist organisation. The subject was Southwest Bulgarian Anarchist Union's organising officer for the town of Stanke Dimitrov. After the anarchist movement was outlawed, the subject carried on with his activity as a militant, taking part in an illegal anarchist conference, distributing mutual aid stamps and collecting funds for anarchists hit by reprisals. As a result of this activity he was sent in 1948 to the Belene labour and re-education camp, where he behaved very badly, being punished several times as a result. He was freed from the camp on 10 August 1953. After his release from the camp, he carried on with his anarchist activity and frequenting anarchist circles. His closest connections are Dimitri Vassiliev Stojanov, with whom he shared lodgings for a time, Bojan Alexev Stefanov, Michail Stojanov Mindov, presently at No 2, Batak Street in Rousse, Vladimir Andonov and llya Gueorguiev Minev. At present the subject meets frequently with the above-named anarchists: they discuss events, swap literature and assist one another. The subject's attitude towards the popular authorities is unfriendly: he makes scurrilous comments, damaging the prestige of the popular authorities. Concerning the change in the currency, and in the presence of agent Nikolov, he made a remark to the effect that in the wake of the change the price of goods would be increasing and the workers' wages shrinking. Apropos of the 25 February 1962 elections, the subject made a statement that the elections are not free, but rather a consequence of the Communists' disarray. In the presence of agent Bogdanov, he declared: Scrutinise events through the prism of a free-thinker who cannot swallow the dogmas of the present communists and then you will understand and see where the world is headed. The communists have stripped peoples of all power and provoked their resistance throughout Eastern Europe, especially in Poland, Hungary and East Germany. There the authorities only manage to hang on thanks to Russian pikes. The Hungarian events are a good example and confirmation of that. In character, the subject is modest, a teetotaller, a non-smoker and a fine worker. He is possessed of a good overall political grounding, reads a lot, knows Esperanto and is a member of the New Path Esperantist society in Pernik. He is a fanatical anarchist who openly declares that nothing on earth can divorce him from his ideas and from his relations with anarchists. 1. As a document, its status is that of a HISTORICAL CERTIFICATE prepared by the regime of People's Democracy for its own use, which is to say by and for the Bulgarian CP as the vanguard of the working class, governing in the name of the class and targeting with its dictatorship of the proletariat, not merely the enemy, but the most typical representatives of the world of work. 2. The document shows how painstakingly the police prepare their files on enemies of the working class's very own regime, because the intelligence collected relates not only to the enemy himself but also to his wife, children, brothers and sisters, and not even his mother and his dead father are overlooked. 3. The subject who is not a human being but merely No 1218 on a police register is, in this instance, an anarchist, a member of the anarchist movement from the age of 18, having served jail time for his beliefs and his militant activities under the old regime and been interned under the current one for years even after the compilation of this file, in 1978, for collecting mutual aid stamps and having helped those of his comrades suffering under reprisals, according to the document itself, and who are many, being a great many from all around the country. 4. This anarchist's file is a magnificent biography (drawn up by the police themselves) of what can be achieved, one which should be a source of pride not only to the worldwide anarchist movement, but above all also to the working class, which has in him an outstanding representative. 5. This anarchist, an enemy of the regime, product of a very poor village family and not of the bourgeoisie is a worker, who as a worker and producer, is very good and he carries out his production tasks conscientiously, in character, he is very modest, being teetotal, a non-smoker and a good worker, not a saboteur, layabout or hooligan, nor a mollycoddled fantasist. Nakov is grateful for this testimonial and we are all in the debt of the DS (Security Directorate) and its agents, the informers whose names are given in inverted commas. It is not merely a biography of an anarchist fighting for freedom and justice, but a genuine multi-biography of an entire people in its unflinching resistance. Note by the representative of the FACB (Bulgarian Anarcho-Communist Federation) in exile: At one time or another I have worked in concert with every one of the comrades named in this article, with the exception of Alexander Nakov's family. I'd be well up for reading his memoirs! (this feels slightly forced after your comments, but its true!).. It is really interesting though and the memoirs will be complemented with a fair few security service documents like the above, which, in themselves, can be very revealing. Yes, Serge, good luck with this, sounds fascinating and exactly the sort of life that would be interesting to read. Sounds like a great idea for publishing the memoirs of a true hero of the anarchist movement, one of so many in the Bulgarian movement of bygone years. Yeah, great stuff I'd read it! Let us know when it's published and I'll get a copy. Thanks to Black Cat Press in Canada, Alexander's biography should be out very soon. Hopefully, it'll be ready this side of the Atlantic for the London Anarchist Bookfair in October. I'm also hoping to run a meeting on Alexander Nakov and Bulgarian anarchism at the same event. Battlescarred, you fancy doing a talk on this with your old mate Serge? Now available from Black Cat Press (http://blackcatpress.ca/Nakov.html). The Dossier of Subject No. 1218 made its debut last weekend at the first Lethbridge (Canada) Anarchist Book Fair. Battlescarred, you fancy doing a talk on this with your old mate Serge? Now I'm going to have to come to the bloody bookfair to hear this talk. I'll have to wear my whistle to irritate the folky-hippies. It's got a historical intro by me. Anyone got a photo of him, or something related to his life we could use to accompany this article? Wikipedia page of Belene concentration camp. Just got my copy through the post thanks to Karetelnik. It looks great.Can't wait to read it! Jammy get. Where's my copy!?!? Alexander gained his “secondary education in fascist prisons” and his “higher education in Bolshevik prisons.” Today, at 97 years of age, he remains a direct link to the heroic years of Bulgarian anarchism. Presented by Nick Heath and Rob Blow, with hopefully (health and technology permitting) a video link-up with Alexander at his home in Bulgaria. 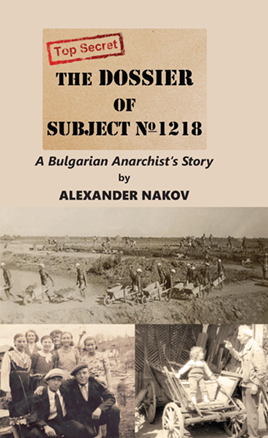 Organised by the Anarchist Federation, this meeting launches the English translation of Alexander Nakov's autobiography, Dossier of Subject No. 1218, published by Black Cat Press. I can now confirm that we will be doing a Skype interview with Alexander and the translator. For various reasons, I'd like to gather a few questions in advance. So if you have any pertinent questions you'd like us to put to Alexander on the day, please PM them to me. We learned that Alexander died a couple of days ago at the age of 99. A life well lived. He remained a staunch anarchist communist to the end.